An exciting mixture of styles, this home blends the wrapping porch of a country farmhouse with a brick and siding exterior, creating a unique and pleasing effect. 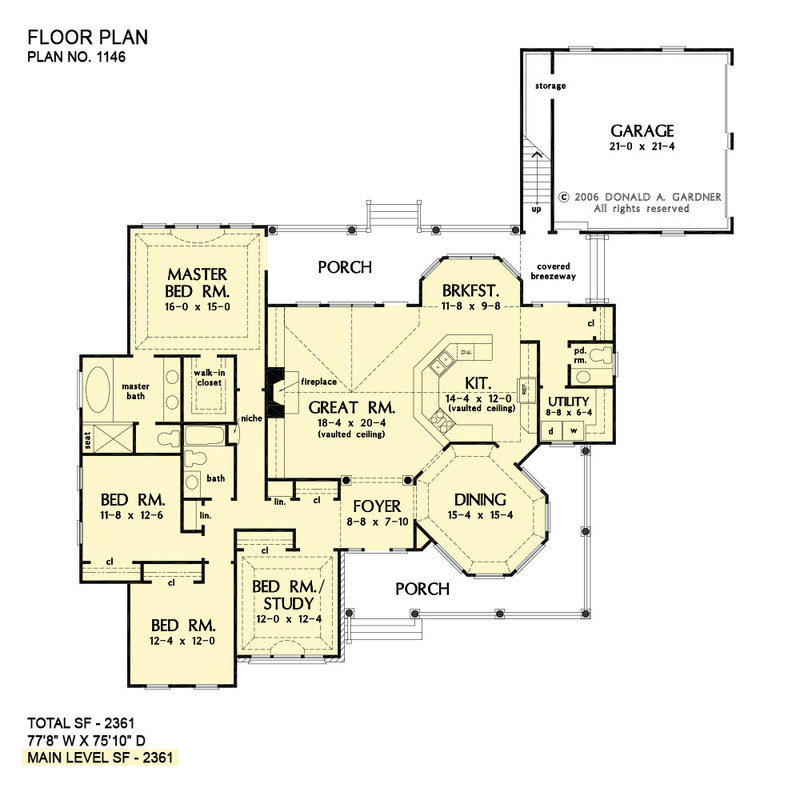 In this house plan, the great room shares its cathedral ceiling with a distinctly open and unusual kitchen. With a generous U-shaped serving bar, the kitchen features room for many. Adding even more architectural interest, the dining room is octagonal shaped and is complemented by a splendid tray ceiling. Built-ins flank the great room's fireplace for added convenience. 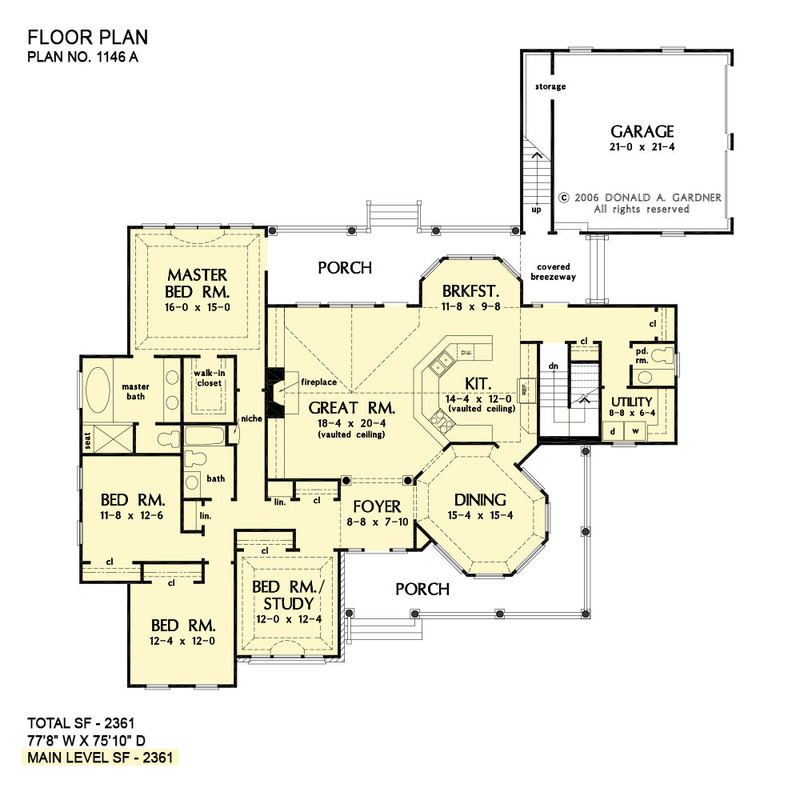 This home plan's master suite is complete with a tray ceiling, arched picture window, back-porch access, private bath and sizable walk-in closet. Another full bath with linen closet is shared by two bedrooms and a bedroom/study that shines with a Palladian window and a graceful tray ceiling. 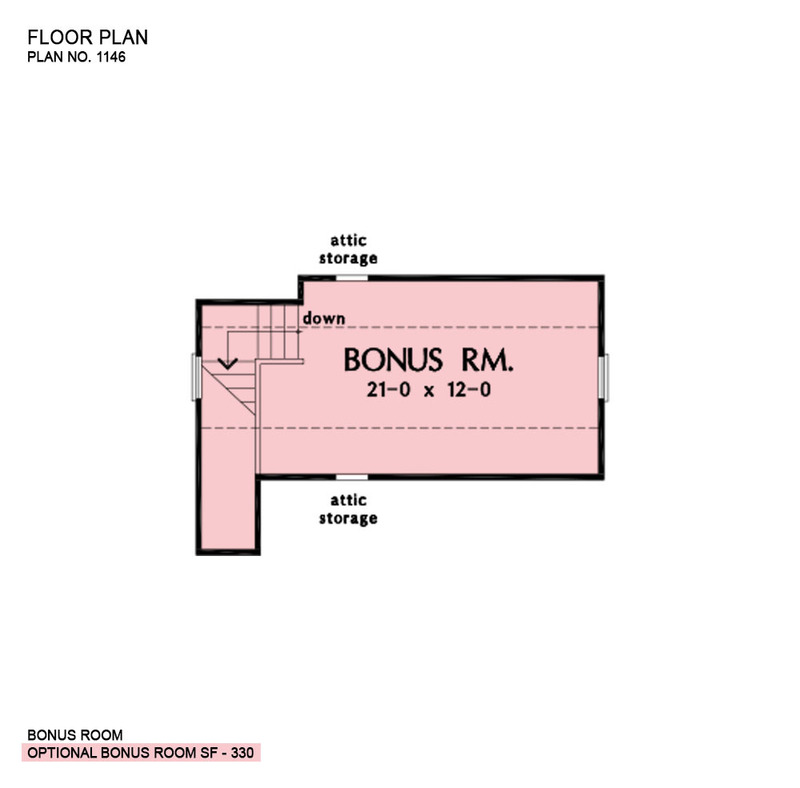 House Dimensions: 77' 8" x 75' 10"
Great Room: 18' 4" x 20' 4"
Bedroom #4 : 11' 8" x 12' 6" x 9' 0"
Bedroom / Study (Tray): 12' 0" x 12' 4" x 10' 5"
Bonus Room : 21' 0" x 12' 0" x 8' 0"
Breakfast Room : 11' 8" x 9' 8" x 9' 0"
Dining Room (Tray): 15' 10" x 13' 0" x 10' 5"
Foyer : 8' 8" x 7' 10" x 9' 0"
Garage Storage (Clipped): 3' 4" x 9' 6" x 0' 0"
Great Room (Vaulted): 18' 4" x 20' 4" x 19' 10"
Kitchen (Vaulted): 14' 4" x 12' 0" x 19' 10"
Master Bedroom (Tray): 16' 0" x 15' 0" x 10' 5"
Other : 8' 0" x 8' 4" x 0' 0"
Porch - Rear : 18' 0" x 9' 4" x 9' 0"
Porch - Front : 29' 3" x 8' 0" x 9' 0"
Utility Room : 8' 8" x 6' 4" x 9' 0"